Human disability raises the hardest questions of human existence and leads directly to the problem of causality—the underlying intuition that someone, divine or human, must have been at fault.Christian theology has responded with almost singular attention to Providence, the expression of divine will in the world as the cause of all things. This preoccupation holds captive the Christian imagination, leaving the Church ill equipped to engage the human reality of disability. 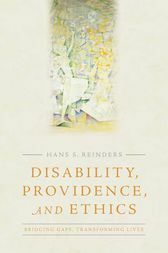 Theological reflection, argues Hans Reinders, can arise only as a second-order activity that follows after real attention to the experience of disability.Disability, Providence, and Ethics offers a more excellent way to address this difficult subject. Reinders guides readers away from an identification of disability with tragedy—via lament—to the possibility of theological hope and its expression of God’s presence. In particular, Reinders reconsiders two of the main traditional sources in Christian thought about Providence, the biblical text of Job and the theological work of John Calvin. Throughout the book, first-person accounts of disability open up biblical texts and Christian theology—rather than the other way around. In the end, a theology of Providence begins with the presence of the Spirit, not with the problem of causality.tension with his Christianity, provoking serious reconsideration of Augustine, his presence in twentieth-century continental thought, and his influence upon modern rhetoric and communication studies.